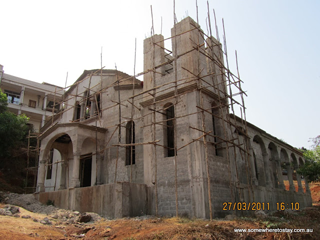 Situated on the side of a mountain with magnificent views of the Freetown Bay, surrounded by properties such as the British Council, The Prime Ministers Office and The House of Representatives, in the prestigious suburb of Tower Hill, the church, when completed, will service the growing Orthodox Christians as part of the missionary work of the Holy Orthodox Diocese of Sierra Leone and its Patriarchal Vicar Fr Themi. The church is part of the Orthodox Teachers and IT college opening in December 2012 and the mission house where Faith, Food and education are paramount to Fr Themi’s mission. Please help Fr Themi in fulfilling the words of Jesus to spread the Gospel in every corner of the world.